Only one substitution on appetizer at $0.50 extra charge. Wonton Soup (2), Egg Roll (2), Chicken Wings (4), Boneless Spare Ribs, General Tso's Chicken, Pork Fried Rice. 3 Wonton Soups, Chicken Fingers (4), Spring Roll (3), BBQ Spare Rib (5), Four Happiness, Asian Garden Special Chicken, House Fried Rice. 4 Wonton Soup, 4 Crab Rangoons, 4 Chicken Wings, 4 Chicken Teriyaki, Gai Poo Lo Mein, Kung Pao Chicken, Beef w. Broccoli, House Fried Rice. Egg Roll (1), Boneless Spare Ribs, Chicken Fingers (3), Beef Teriyaki, Chicken Wings (2), Fried Shrimp (2). Chicken, shrimp, vermicelli, fresh veggies, wrapped in rice paper w. peanut sauce. Tasty soup with rare steak, and fresh rice noodle. Soup with tender beef meatballs and rice noodles. Hot and spicy lemongrass soup with chicken or beef. Sliced beef sauteed onions w. lettuce. Vietnamese fried egg rolls with vermicelli. Grilled marinated pork, shrimp and egg roll on vermicelli. Tender juicy pork, shrimp, fried tofu, mixed with a sweet tangy sauce to compliment the vermicelli. A new blended taste of lightly battered shrimp with a creamy sauce topped with cashews. Marinated shrimp wrapped in a freshly cooked bacon and lightly rolled in an egg roll skin. A deep fried golden chicken wing mixed in with a signature spicy red Thai sauce. A fresh bowl made out of cabbage, with tender pan fried beef inside, dressed in a chili-lime dressing topped with fresh herbs on top. Sauteed shrimp lightly dressed with a sweet coconut sauce & curry mixed intto a chicken broth with an eggplant and mushroom mixture. Tender beef mixed in with a coconut curry sauce. Tasty ribs marinated with sweet pineapple juice, lemon grass, and tangy sweet sauce on top. Choice of chicken, beef, pork, ham, or veg. Choice of Vegetable, Beef, Pork, Chicken or Shrimp. Moo Shi is a tasty traditional Asian dish, that contains meat, mushrooms, cabbage, scallion and scrambled eggs, served with 5 pancakes. Choice of vegetable, chicken, beef, pork, subgum, or shrimp. Served with crunchy noodles. Choice of veg. beef, chicken, pork, subgum or shrimp. Chunks of tender steak, jumbo shrimp, sea scallops, lobster meat, snow pea pods, water chestnuts, straw mushrooms & baby corn, All simmered in a zesty oyster sauce, served on a bed of lo mein & garnished with colorful shrimp chips. Fresh scallop, shrimp, chicken, roast pork, beef sauteed w. snow peas, mushroom, water chestnuts, baby corn, Chinese vegetable. Tender chunks of chicken meat deeply fried in a specialy blended batter, combined w. beef, shrimp, imitation crab, choice of Chinese vegetables, Displated on a bed of lo mein. Jumbo shrimp, sea scallops, chicken & roast pork, sauteed w. mushrooms, water chestnuts, snow pa pods, and Hawaii Pineapple. Served on a hot sizzling platter. Jumbo shrimp, chicken, meat, tender beef & cubes of roast pork sauteed with mixed Chinese vegetable in a delightful Gourmet sauce. 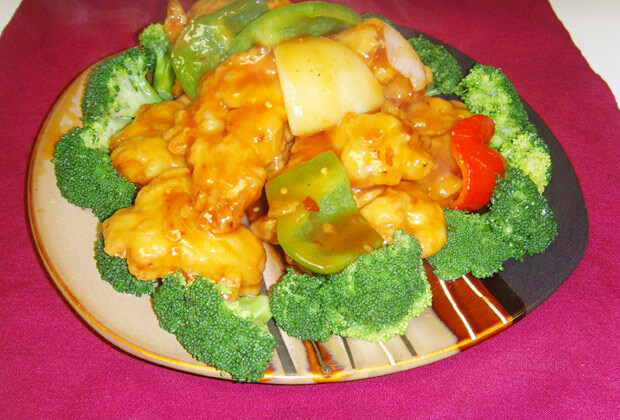 Jumbo shrimp, chicken & tender beef blended w. mixed Chinese vegetables. Garnished with golden fried wonton. Shredded chicken, roast pork, beef sauteed with shredded mixed Chinese vegetables. A wonderful arrangement of jumbo shrimp, sea scallops, tender beef, together with mixed Chinese vegetable, served on a bed of pan fried noodles. Jumbo shrimps, sea scallops, lobster meat & crab meat sauteed w. vegetable, served in a crispy bird's nest. A fantastic combination of jumbo shrimp, sea scallop, lobster meat, sauteed w. snow pea pods, baby corn, water chestnuts, mushroom, crowned w. deep fried fish in egg batter. Jumbo shrimp, chicken, tender beef, green & red pepper, celery, mushroom, baby corn all sauteed in a hot & spicy Hunan sauce. All steamed w. sauce on the side with white sauce. Only one substitution on Appetizer at $0.75 extra charge.